In order to be able to address this question we have carried out a study on how our NEBOSH General Certificate (NGC) online learners perform and what kind of experiences they enjoy compared to classroom learners. The study combined data analysis with targeted interviews to ensure we could not only identify any issues that learners encountered but also understand why these were problematic. More than 50% of learners who have completed their NGC via online learning with Astutis participated in the study. No provider has a 100% first-time pass rate and we made sure this study included learners who failed at the first attempt so that we could find and examine the reasons why. In order to put the experiences of the online learners in context, we surveyed a randomly selected group of classroom learners of a comparable size so that meaningful comparisons could be made. No significant difference was observed in either first-time success rate or individual paper scores between classroom and online learners. ‘The advantage of online learning is obviously the flexibility that it affords you; you can study a whole day on it, a few hours here and there; you can juggle it to suit your lifestyle.’ This quote from an interview with an online learner highlights some of the reasons people choose online learning. How Much Time do I have to Spend on the Course? Those choosing the online learning option can choose how much time they spend engaging with the online learning materials. People have different levels of existing health and safety knowledge depending upon their work experience and so it may take them more or less time to master all the areas covered. It is useful to note, however, that those spending less than twenty hours online engaged with the course failed their exams at the first sitting. Whilst there is no direct link between the time learners spent online and the results they achieved, talking to individuals it becomes apparent that realising your own starting point is an essential first step to appreciating how much time you will need to allocate to your learning. One very experienced learner spent only 23 hours online and achieved a distinction, whilst another, less experienced, learner’s 42 hours could not avoid a first-time failure. NEBOSH recommends 80 taught hours for the NGC, combined with 53 hours of private study. This is what you will get in the classroom, but online learners can spend as long as they feel they need, with one learner in our study spending 341 hours online engaging with the online learning materials (this learner passed first time so we know all that study paid off). The study also highlighted that learners who already work in a health and safety role find it easier to contextualise the material, giving them an advantage when it comes to applying their knowledge in NEBOSH exams. This study shows that for a large number of people who choose online learning it was the right decision. In fact, the exam results were not different to those for classroom learners. If you do not have a great deal of experience in health and safety, good quality online learning can offer lively, interactive resources that provide context and help you master the material at your own pace. Equally, for more experienced learners you can be selective on which areas you cover in-depth, making use of revision quizzes and past exam question to ensure you have what you need to prepare you for the NEBOSH exams. Daniel is one of the Learning Designers at Astutis; he joined Astutis following five years as a secondary ICT teacher, championing the use of Internet technologies to support classroom learning. Daniel has recently completed an MA in Education, looking at the role of information technology in education. 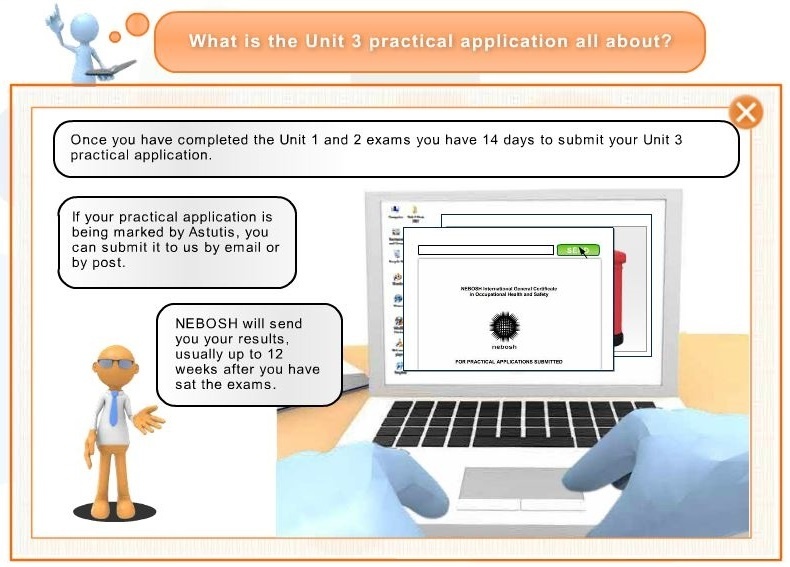 His final year project looked at the factors affecting success on the Astutis online learning course for the NEBOSH National General Certificate and he has drawn upon this research in his post.